old world bluestem-alfalfa-sweetclover mixture grown at Texas Tech University New Deal research farm near Lubbock, Texas. Ogallala aquifer, which stretches across eight states in the US, provides supplemental irrigation for agriculture and livestock production in the Southern High Plains of Texas. However, the vitality of the Ogallala Aquifer is threatened due to water withdrawn rates far exceed the annual estimated recharge rate. The agricultural output in this region will decline if more resource-efficient management practices are not adopted. Some growers in the semi-arid Texas High Plains are transitioning their irrigated cropland to dryland or low-irrigation production of grasses such as ‘WW-B.Dahl’ cultivar of old world bluestem (OWB) for hay and grazing cattle due to diminished water supply from the Ogallala aquifer. This warm-season, perennial grass is drought-tolerant in dryland and limited-irrigation conditions. Old world bluestem grass helps protect soil from erosion, recover soil organic matter, and improve soil quality/health (the capacity of a soil to sustain essential functions). 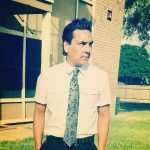 Recent studies showed that this grass strongly deters soil-dwelling harmful ants (Bhandari et al., 2018c), slightly deters honey bees (Bhandari et al., 2018d) compared with adjacent alfalfa and native grass pastures; however, its effects on soil microbial communities, enzyme activities, total N and organic C were unknown. Another study on the same research site demonstrated a numerical tendency for deterrence of horn flies on cattle grazing OWB (Bhandari et al., 2018a), but no clear inhibitory effects of OWB on canopy-dwelling insects were found (Bhandari et al., 2018b). Information is needed to investigate if OWB had similar inhibitory effects on soil microbial communities and their functions. Soil microbial communities, as the primary source of soil enzymes, mediate nutrient cycling and organic matter transformations, thus the important component of soil health. Enzymes involved in C and N transformation are considered indicators of soil health because enzyme activities are sensitive to management practices. The objective of the study was to determine whether the inhibitory effects of OWB on soil-dwelling ants extend to soil microbial communities in relation to other adapted forages. In this study, we compared soil microbial and chemical properties for OWB relative to OWB mixed with alfalfa, alfalfa-alone, and native mixed-grass pastures at 0–5 cm and 10–15 cm depth in June and December of 2016. Soil microbial biomass carbon and microbial biomass nitrogen, enzyme activities associated with C, N, and S transformations (β-glucosaminidase for C and N release and arylsulfatase for S release) were analyzed. Soil organic carbon and total nitrogen were also determined. Credit: Krishna B. Bhandari from dissertation Retrieved from https://ttu-ir.tdl.org/handle/2346/74378 (PhD dissertation). 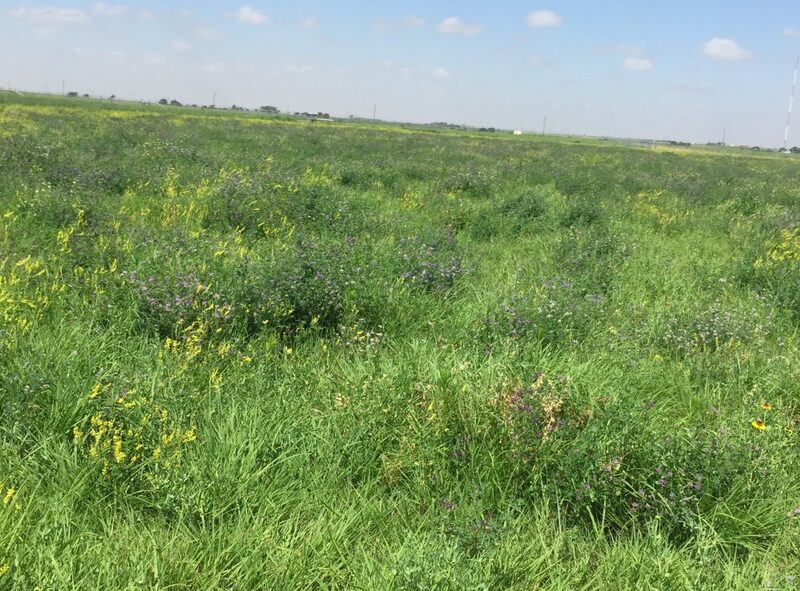 The results showed that the pastures of OWB mixed with alfalfa had the greatest soil microbial biomass nitrogen, soil organic carbon, and total nitrogen. Similarly, OWB-alfalfa had always higher microbial biomass carbon. 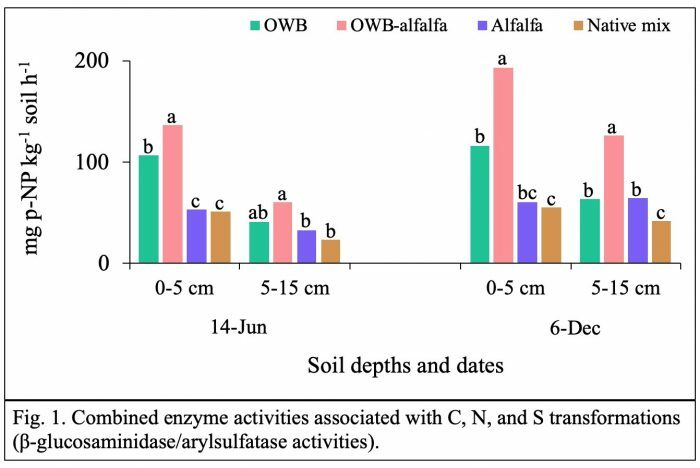 The enzyme activities involved in C, N, and S transformations were found to be greatest in OWB-alfalfa and numerically lowest in native mix in both 0-5 cm and 5-15 cm sampling depths and at both June and December samplings (Fig. 1). The lower soil microbial communities and soil chemical parameters in June than in December occurred as a consequence of higher temperatures and lower precipitation. The strong deterring effect of OWB on ground-dwelling ants did not carry over to suppression of soil microbial communities. Both OWB-based pasture systems showed lower ant populations and consistently greater soil microbial communities. OWB-alfalfa was found to be a promising combination for improving agroecosystems through ant deterrence while enhancing soil health indicators and hosting overall insect diversity. Bhandari, K.B., C.P. West, and S.D. Longing. 2018a. Fly densities on cattle grazing ‘WW-B.Dahl’ old world bluestem pasture systems. Texas Journal of Agriculture and Natural Resources. 31:T1–T5. traps. Crop Forage Turfgrass Management. 4:180005 doi:10.2134/cftm2018.01.0005. Pollinator abundance in semi-arid pastures as affected by forage species. Crop Science.58 (6):2665-2671. doi:10.2135/cropsci2018.06.0393.